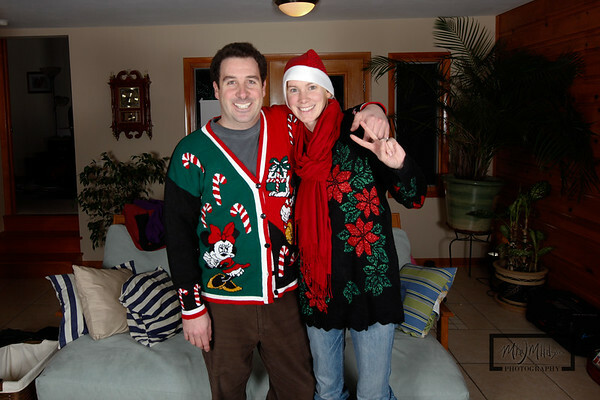 In order to ensure that the Photo Booth was operational for the New Year's Eve wedding, I arranged to test it out at a Bad Holiday Sweater party. 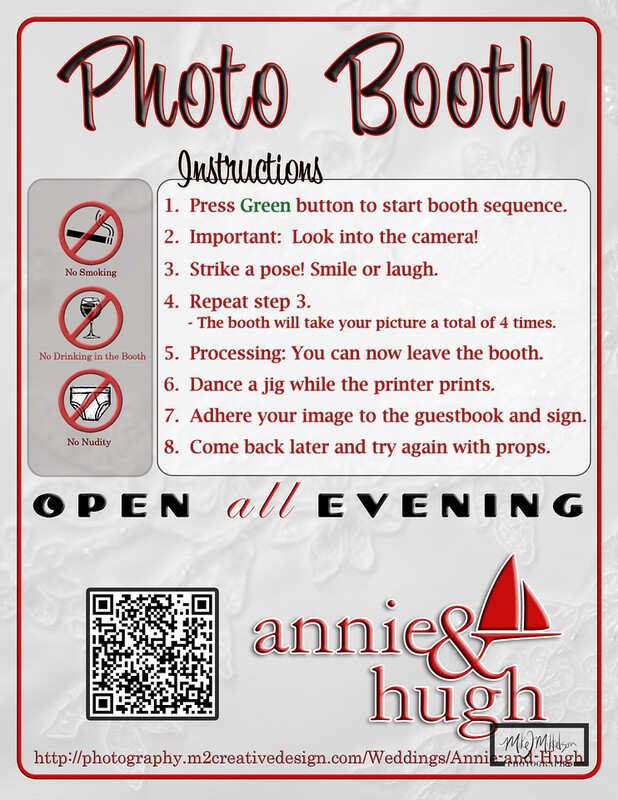 This not only was valuable in creating a run through on transporting the booth, but setting up and configuring the lighting and photo booth software. 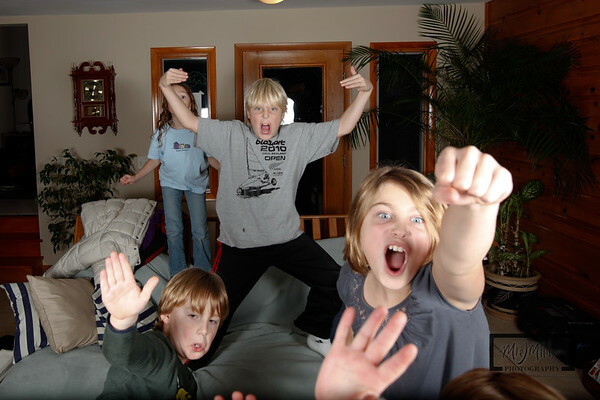 The party had a number of kids who were able to figure out the booth in only a few seconds, which was great news for the arcade buttons ease of use. It only took about 20 minutes from the car to get it fully set up inside. 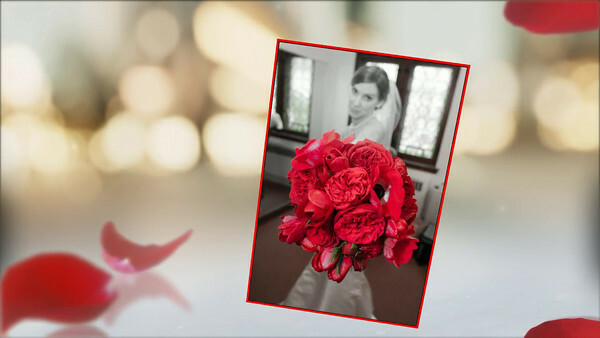 It was not only fun, but this preparation ensured that the wedding would go smoothly. 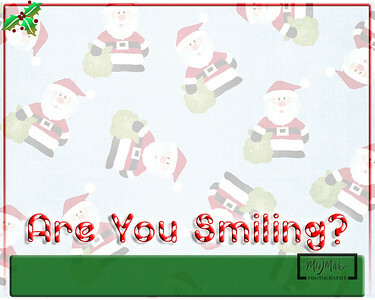 The Breeze Systems software worked great, as I was able to create custom screens specifically for the Holiday get together. This is the Screen that is enabled when "Live View" is off. I programmed the black arcade button to switch to this mode when the booth was not being used. This is the background screen while the booth is idle, but in Live View mode. The 5D Mark II Canon camera displays the users in the booth in mirror mode, so it looks like a mirror. There are a number of screens that are displayed in sequence before each picture is captured. 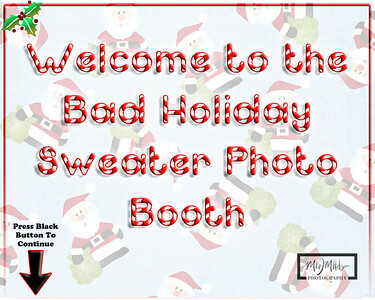 I had the booth configured to take 4 images, so I made 4 different backgrounds. 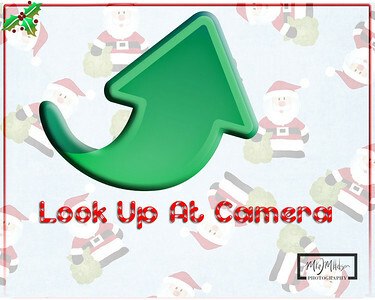 Since it's natural for users to watch themselves on the screen, I created a background to display 1 second before the images is captured to remind them to look up at camera. 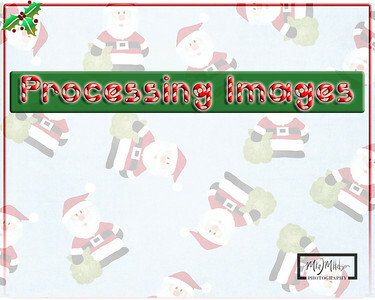 After the 4 images are captured, this is the processing screen that displays to the users. The Breeze system software can be customized with optional screens, and allows the booth to be tailored specifically for the event. 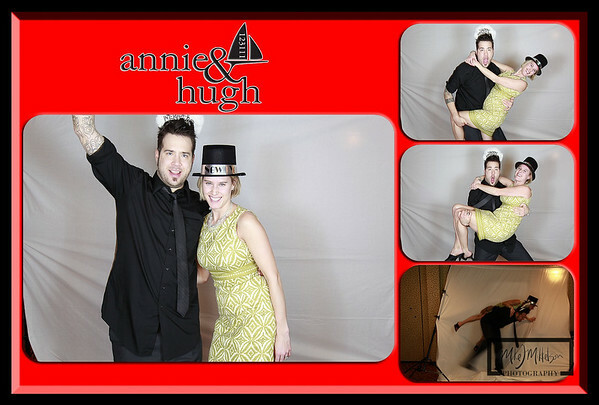 The New Year's Eve Sugar Wedding at the Edgewater Hotel in Madison, Wisconsin was epic. The DIY Photo Booth was built specifically for this event, and it turned out fantastic. 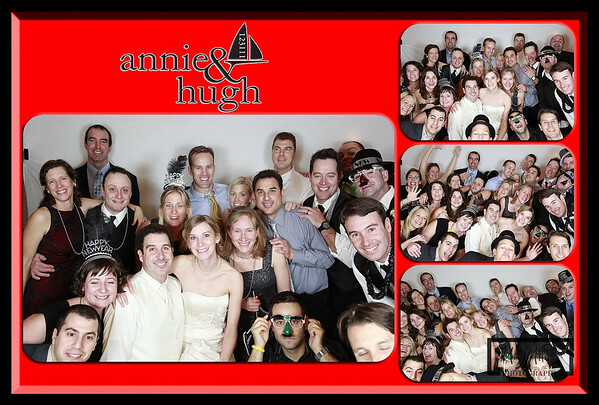 The booth was busy non-stop for almost 6 hours, and was described as the hit of the wedding. Aside from a few minor glitches in the beginning, the booth ran fairly smoothly for the duration. A few printing issues, and initial remote flash issues were cleared up, and people were enjoying the open-air booth the entire night. Here is the booth and printer table at the reception. 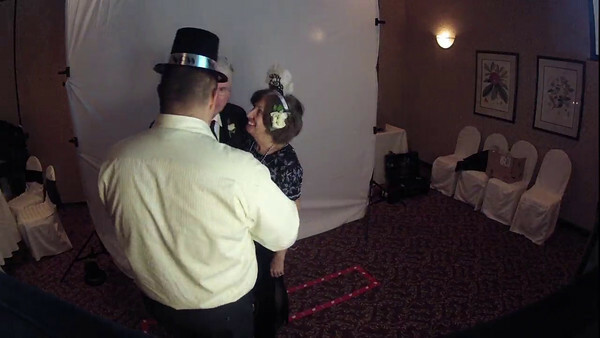 You can see here the mounted softboxes, as well as the GoPro HD Hero 2 on a flexible mount. 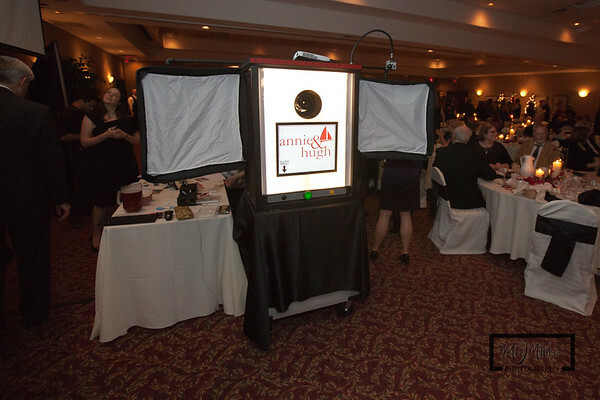 The built-in softbox provided illumination to help with live view preview. You can also see the projector on the top of the booth pointed perpendicular to the user area showing the slideshow up on the screen. 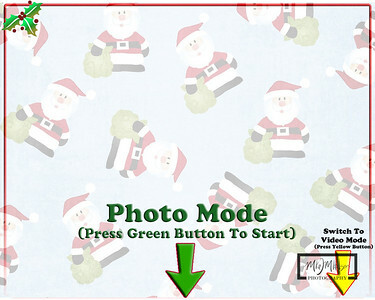 Images were added to the slideshow as they were captured using the Breeze viewer software. The screen on the back of the booth and the projector were mirrored to show the same slide show on both screens. Backdrop Casualty: Too much to drink? Why not attempt some crazy poses and fall into the backdrop! It was funny at the time. 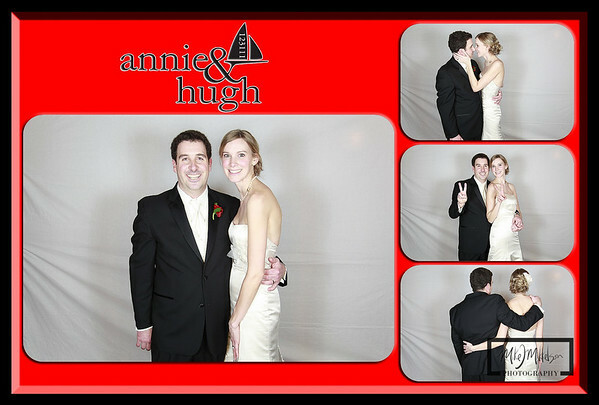 The Bride and Groom: Hugh and Annie! We learned that you need to ensure that you have someone monitoring the booth so people stand in the right spot. My wife was also kind enough to help people with the printed images and the guestbook. Apparently, 2-sided tape is pretty complicated, and some people just wanted you to do it for them. Also, people cannot seem to keep their hands off the printers, and couldn't understand that the paper goes through a few times until it's done. Having a guestbook table monitor was key. I also learned that having enough time before the event to test lighting is essential. The mood in the room was different from when we set up the previous day, so we had a bit of a delay getting this configured at the start of the event. 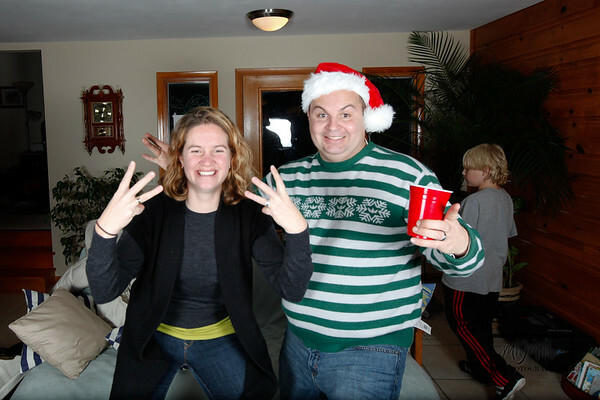 Considering that we used remote flashes with softboxes, it worked out great. Just ensure that the flashes, pocket wizards, and camera all had fresh batteries. I had to change the battery on the camera 2 times before the end of the 6 hours. Live view definitely takes a toll on the charge. If I were to have a go at this business for other events, and not just a friends wedding, I'd want to ensure that I upgraded to a faster printer. Towards the end of the night, we were almost an hour behind in printing, as we were printing 2 copies of each overlay; one for the guestbook, and one for the users. We switched this to one copy after a majority of people had gone through the booth , to try and catch up. The project was a neat addition last minute. Projecting the images up on the screen above the photo booth generated and kept interest in the booth all night long. Highly recommend using that again. The cloned second monitor had issues with VGA, and had a green tint. I think I'll use the booth with the digital DVI cables in the future to prevent this. 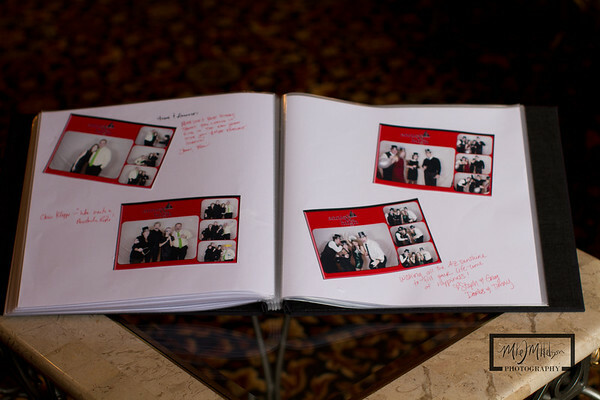 The guestbook was also popular with the guests, and using the images from the photobooth gave them a unique and creative momento that was signed by everyone at the party. Overall, I'm very please at the results, and the Bride and groom are happy. Everyone complimented us on a neat idea, as many people have not seen this before. 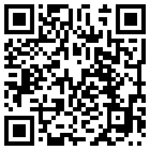 The question is, do I continue to offer this as a service??? Katie Mikkelson for manning the guestbook station, and making sure guests didn't touch the printers or run off with the prints. Jaron Berman for helping set up and configure the lighting. Matt Schroeder for grabbing my camera while I was operating the booth, and taking images at the reception.